One of the key reasons why businesses rush to the Cloud is to enable users to access content from anywhere there is an Internet connection. This is beneficial when users are highly mobile or there are multiple work and office locations. The drawback is that without an Internet connection, work and Customer Relationship Management (CRM) come to a complete halt. If you do have multiple people in your office that need to collaborate and share a centralized, institutional customer relationship system, ACT! Premium 2013 can be installed on your own company server and shared with everyone in your Office. In fact, even if you have users who work from home or in another State, as long as they periodically have access to the Internet, all of the information in the master company version of ACT! Premium 2013 can be synchronized with the remote user (any user who is off-site and not in the Office) so that everyone always has the most current information about a contact. For users in the Office, any updates to a Contact record are immediate and in real time. ACT! Premium 2013 supports field level locking so if two different users are in the same contact record, only one user will be able to edit a field (like the phone number) at a time. All users can make updates regardless of if they are in or out of the Office. ACT! Premium 2013 will review all of the changes by each user and make sure the latest ones are kept. The key advantage of ACT! Premium 2013 as a Customer Relationship Management solution is that it enables you to remain 100% productive regardless of if you in the office and connected to your company server or if you are on the road and working from the beach between meetings. Whenever Internet access is available, ACT! Premium 2013 will automatically synchronize updates between your Mobile Warriors and the Office. In real life, “Clouds” come and go. With ACT! Premium 2013, it is always a clear Blue Sky. Do you wish there were some Application you could run locally on your computer so that your contact address book information would be available at all times – even when you had no access to the Internet? An Application that would allow you to maintain not just a contact’s basic address information, phone, and email but also maintain a complete history of all communication with that contact? What about if it could keep track of the status of the sales cycle and show all of the other related contacts? How about if you could collaborate and share Contact information across your company so that everyone had the same “Institutional Knowledge” about a Client? ACT! Premium 2013 is a full featured, contact and customer relationship manager (CRM) that supports pipeline selling, full history of communication, tasks, notes, history, appointments, calendar scheduling, contact status, mail merge, reporting and social media. What makes ACT! Premium different from SalesForce and SugarCRM, (the two most popular Cloud based CRM platforms), is that unlike Cloud based services, your contacts are 100% safe and secure on your on PC or your own company file server and accessible with or without Internet Access. That means the next time you have a five hour plane trip from NY to LA, you can be actively working on your sales and marketing efforts by reviewing the current status of your proposals, projects, and campaigns. You can draft letters, create email messages and mail-merge personalized email or letter campaigns, schedule meetings, tasks, analyze reports and look for cross-sell opportunities. All of this and more simply because ACT! Premium 2013 is installed locally, on your notebook (or PC) and accessible regardless of the availability of an Internet connection. Put the “personal” back in “personal computing” and say, “Goodbye Cloud” and Hello to the personal computer completely under your control. Note: ACT! 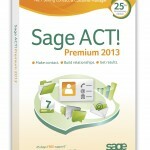 is available in a Pro version but to get the full benefits that I will be discussing in my “ACT! Chronicles” Series, the Premium version is required particularly for the Web and Mobile features. The Pro version may be appropriate if you will be the only user and do not have a need to share your contacts with anyone else or access your contacts from the Web or a Mobile Device. This would be true if you always carry your notebook computer with you wherever you go.